As institutions of higher education embrace civic engagement, service learning has emerged as a most effective way to engage students in field experiences where they will confront profound questions of the relevance of academic learning to addressing community needs. Each volume in this series is organized around a specific community issue, and provides multiple perspectives on both the theoretical foundations for understanding the issues, and purposeful approaches to addressing them. The contributors to these books—who represent disciplines in the sciences, humanities and social sciences—offer vivid examples of how they have integrated civic engagement in their courses, explain their objectives, and demonstrate how they assess outcomes. To stimulate adaptation of the approaches described in these books, each volume includes an Activity / Methodology table that summarizes key elements of each example, such as class size, type of community partner, the activity and the methodology or pedagogy employed, and potential applications of the example in other disciplines. 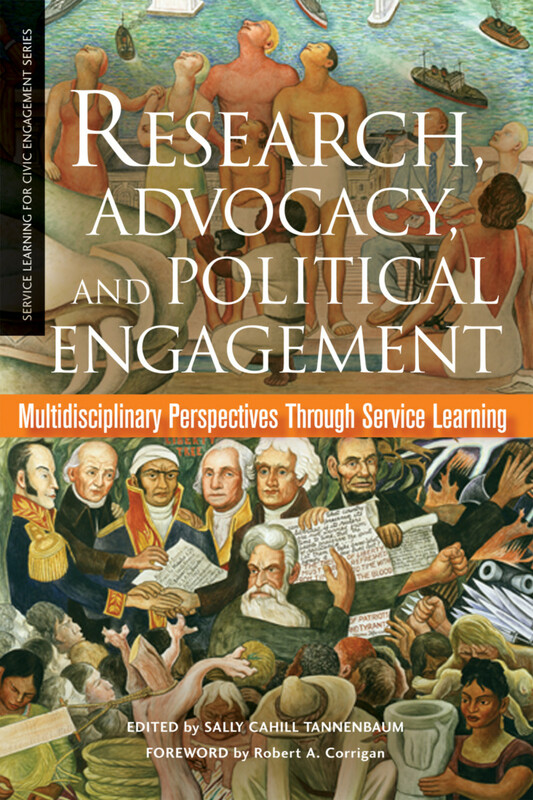 This volume presents inventive approaches to using service learning to introduce students to political engagement. The work of faculty representing a wide variety of disciplines, this compilation of innovative and varied courses offers models to adapt and ideas to stimulate the creativity of instructors. The contributors view political engagement from distinct vantage points. Political scientists look at political engagement from a more traditional perspective. Mathematicians develop courses that explore the statistical implications. Economists focus on cost benefit analysis. Business professors provide an entrepreneurial angle. Feminists consider the language implications of political engagement. The chapters in this book describe how teachers in Politics, Education, Urban and Regional Planning, Business, Communications, Sociology, Mathematics, Economics, and Women’s Studies have created effective activities that advance disciplinary knowledge, develop collaboration with communities, and engage students in the political process. "This volume edited by Tannenbaum (communication, California State Univ., Fresno) includes case studies of service learning in college courses across disciplines and across universities in California, written by the professors who implemented them. The introduction provides a good overview of the book's individual chapters, including an unusual but very useful organizational chart. The book groups chapters into four sections: traditional approaches to political engagement, a business perspective (focusing on an economics class and a business class on entrepreneurship), social activism, and K-12 outreach. Individual authors situate their chapters within research, describe their projects in detail, and offer solid (if modest) evidence for positive student outcomes. Every chapter is thoughtful, interesting, and scholarly, providing examples of service learning in a variety of disciplines: political science, math, sociology, teacher education, economics, women's studies, communications, and others. Some, particularly those at the ends of the political spectrum (i.e., the business perspective and social activism sections) are fascinating. However, the examples in the book offer something for professors of all fields, and make this book an indispensable resource for those interested in adding a service learning component to their courses. Summing Up: Highly recommended. Graduate and research collections." Acknowledgments; Foreword—Robert A. Corrigan; About This Series—Gerald S. Eisman; Introduction—Sally Cahill Tannenbaum; Activity/Methodology Table; Contributors; SECTION ONE: TRADITIONAL APPROACHES TO POLITICAL ENGAGEMENT: 1) Beyond Service: Community-Based Research and Political Engagement—Corey Cook; 2) Communication in Political Campaigns: Bridging Theory and Practice—Sally Cahill Tannenbaum; 3) Social Research and the Sacramento State Annual Survey of the Region—Amy Qiaoming Liu, Otis Scott, Joseph Sheley, Frank Whitlatch, Ernest Cowles, and Manuel Barajas; 4) Making the Census Count: Learning, Service, and Political Engagement—Peter Tannenbaum and Sally Cahill Tannenbaum; SECTION TWO: PROVIDING A BUSINESS PERSPECTIVE TO POLITICAL ENGAGEMENT: 5) The Economics of Community Action: Applying Cost-Benefit Analysis to Local Public Policy—Greg Hunter; 6) Selected Case Examples of Service Learning in Business: Social Entrepreneurship—Richard L. McCline and Gerald S. Eisman; SECTION THREE: POLITICAL ENGAGEMENT THROUGH SOCIAL ACTIVISM: 7) Communicating Community: Engaging Silicon Valley Through Student Activism—Anne Marie Todd and Deanna L. Fassett; 8) The Politics of Service Learning in Introduction to Women’s Studies: Addressing Social Injustices Through Activism—Natalie Wilson; 9) Using Service Learning to Change Social Structure: The Gulf Coast Civic Works Project—Scott Myers-Lipton; SECTION FOUR: TEACHING OTHERS THROUGH POLITICAL ENGAGEMENT: 10) Media Mentors: Nurturing Democratic Ideals Among High School Journalists—Linda Bowen; 11) An Unconventional Approach to Civic Skill Development and Service Learning—Mary Kirlin; 12) Developing Teachers’ Ability to Share Leadership—Kristeen L. Pemberton; 13) Service Learning Which Engages Students in the Implementation of Children’s Right to Participate in Community Decision Making—Kim Knowles-Yanez; Index. Sally Tannenbaum is Associate Professor of Communication at California State University, Fresno.